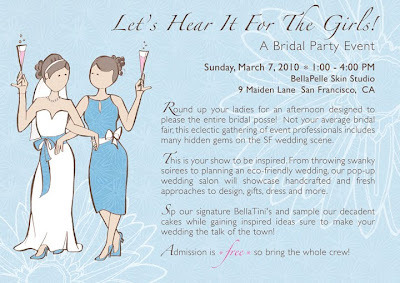 Weddings by Christina Diane: Let's hear it for the girls: A bridal fair! Let's hear it for the girls: A bridal fair! Lots of goodies, great vendors, signature cocktails and snacks at the swank BellaPelle Skin Studio in San Francisco. I'd love for you all to be there! Bring your friends, your mom, your aunt, your grandma— anyone who wants to gush in all wedding goodness. Not only are there going to be lots of eye candy, it's a great way for your bridal party to get to know me! I'd love to see you all there— & don't forget to bring your besties!